These Ballpark Pretzels, fresh from the oven, will satisfy your craving for the chewy, pull-apart, salty pretzels you can get at a baseball stadium. I predict that, if you have about six people over for game day, and you serve these pretzels fresh from the oven, the pretzels will disappear in about five minutes. 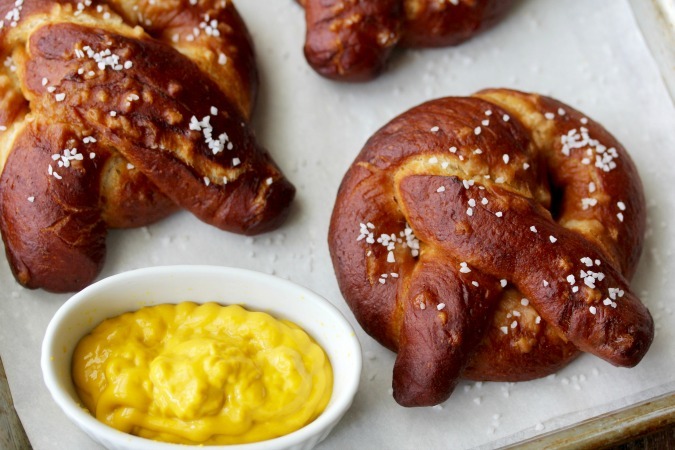 There is something about a hot pretzel, sprinkled with salt, that brings back childhood memories of going to the game with your dad, or hanging out at the county fair as a kid. 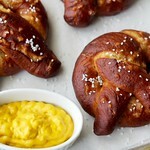 These pretzels are wonderful dipped in mustard, melted butter, or a cheesy sauce. I've always had trouble shaping pretzels, and this was no exception. While making these, I think I finally had an epiphany, and I wish I'd taken photos of my process. To shape the pretzels, after rolling the dough out into a long rope, you shape it into a long/tall "U." After shaping it into the long/tall "U," you cross the two ropes around each other twice in the middle. The dough should look sort of like those ribbons that people wear to support causes, but crossed over twice instead of once. At this point, you have two choices. You can either flip the bottom of the "U" over the knot, or the knot over the "U." Does this make sense at all? I flipped the bottom of the "U" over the knot, and then turned the shaped pretzel over. 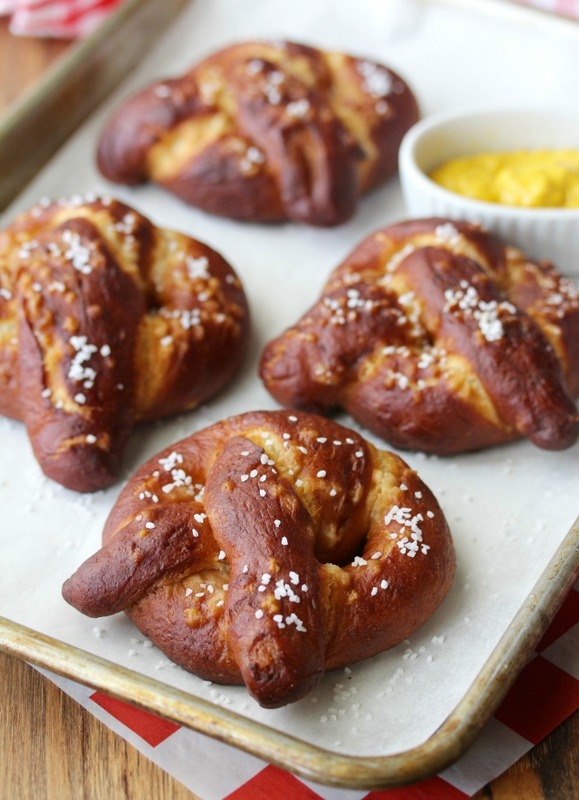 When you shape these ballpark pretzels, you might think that they are a bit "leggy." Don't worry about it, because they will fatten up when you boil and bake them. These pretzels are best straight from the oven, but they are easily revived in a 300 degree oven. Wrap any leftovers individually in foil, place them in a zip lock freezer bag, and place in the freezer. 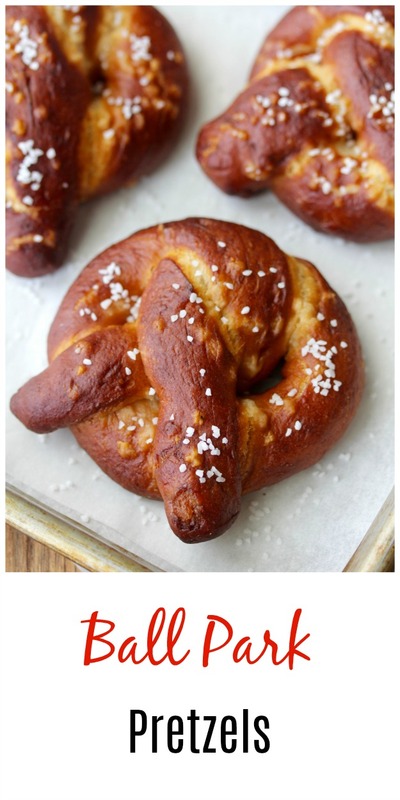 If you plan on making these pretzels in advance and then reheating them, you might want to try not salting them, as the salt kind of melts into dough over time (which is not a big deal, but may not be aesthetically pleasing to you). Instead, when it's time to serve them, just spray them with water, salt them, and then reheat them in the oven. If you prefer, you can also top these with sesame seeds or poppy seeds. If you'd like to go sweet, you can top these with Swedish pearl sugar. 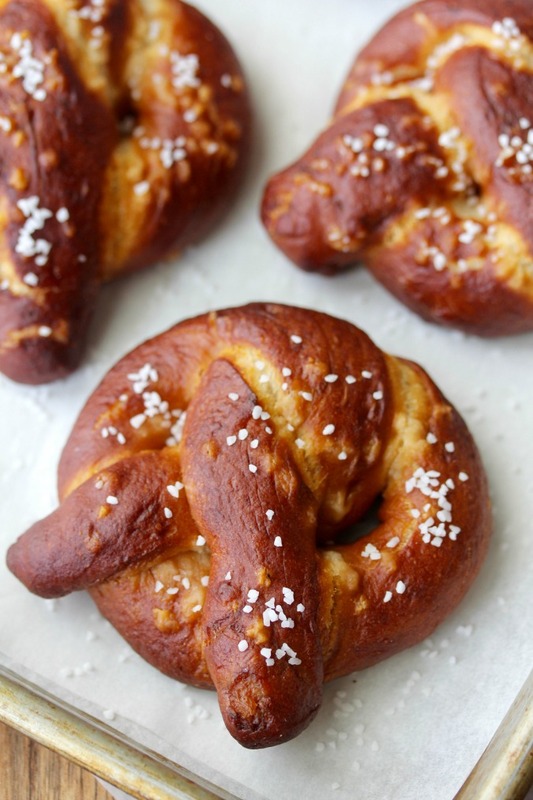 I topped these pretzels with pretzel salt, but kosher salt works just fine. If you do use pretzel salt for the topping, still use kosher salt in the dough. 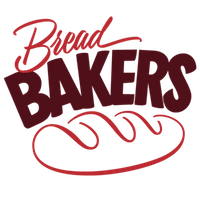 This month the Bread Bakers are making all kinds of pretzels! Thanks so much to our host (and my friend) Stacy of Food Lust People Love for this theme. 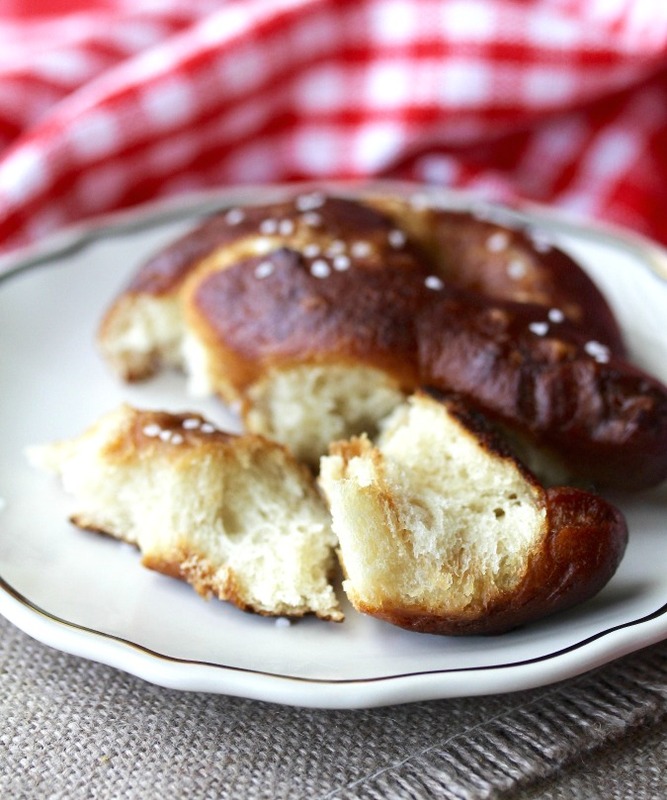 After the recipe, be sure to check out the rest of the pretzel recipes! In the bowl of a stand mixer, whisk together the flour, salt, and yeast. In a four quart glass measuring cup, whisk together the water, 2 tablespoons of the vegetable oil, and the brown sugar until the sugar has dissolved. With the dough hook on low speed, slowly add the water mixture to the flour mixture and mix until the dough begins to come together, about two minutes. Increase the mixer speed to medium-low, and knead with the dough hook for eight more minutes. Remove the dough from the bowl and shape into a ball. Place it into an oiled bowl or dough rising bucket. Cover with plastic wrap, and let rise until doubled, about 60 to 90 minutes. Lightly flour two half-sheet pans. Deflate the risen dough and press it into a 12 inch by 6 inch rectangle. Using a bench knife, cut the dough into 12 six inch by 1 inch strips. Cover with oiled plastic wrap. Take one strip at a time, and roll it out to a 22 inch rope. Form the rope into a long "U" shape, and cross the sides of the "U" over each other twice in the middle. Fold the "U" over the knot. Flip the pretzel over and place it onto the floured baking sheet. Cover with oiled plastic wrap. Continue with the rest of the dough. You will have 6 pretzels on each baking sheet. Let rise for 15 minutes. With racks on the upper and lower third of your oven, heat the oven to 425 degrees F.
Add 4 cups of water and the 1/4 cup of baking soda to a 3 quart sauce pan and bring it to a boil over medium-high heat. Using a fish spatula or slotted spoon, transfer four of the pretzels to the simmering water, knot side down. Flip the pretzels over after 15 seconds, and simmer for 15 seconds more. Transfer the pretzels to a wire rack, and repeat with the rest of the shaped dough. Let the pretzels rest for five minutes. In the meantime, wipe the baking sheets clean and oil with 1 1/2 teaspoons of the oil per baking sheet. Sprinkle the sheets with 1/2 teaspoon with kosher or pretzel salt per baking sheet. Place six pretzels on each baking sheet and sprinkle the pretzels with salt. Bake the pretzels for 15 to 20 minutes, rotating the baking sheets halfway through, until the pretzels are a deep mahogany. Transfer to a wire rack and let cool for 5 to 10 minutes. Serve warm (see notes above about freezing and reheating). Recipe adapted from Cook's Country magazine, November 2014. Great tips on reheating and freezing without salt Karen. Gorgeous color! I like going with less salt and letting people dab on a plate if they want, maybe adding some herb. I am the oddball who flicks most of the salt off. LOL! Ha ha. What a great idea! Such pretty pretzels!! I LOVED the color you got there! Thank you! I was pretty happy with it. They are the perfect game day treat, for sure!! Karen, your Prezels are bright and beautiful and those salt crystals are such a lovely contrast! These look so great for a snack and the have an amazing color. These pretzels are perfect and I don't think they would make it until company got there! Thanks! I was pretty happy with them. Those pretzels look sooo good Karen. Wish I could pick one up right now. Where can you buy pretzel salt? I got mine from King Arthur Flour.